A.L. Morrow, Regulation of GABAA Receptor Function and Gene Expression in the Central Nervous System. R. Hitzemann, Y. Qian, S. Kanes, K. Dains, and B. Hitzemann, Genetics and the Organization of the Basal Ganglia. P.J. Whiting, R.M. McKernan, and K.A. Wafford, Structure and Pharmacology of Vertebrate GABAA Receptor Subtypes. B. Borowsky and B.J. Hoffman, Neurotransmitter Transporters: Molecular Biology, Function, and Regulation. B.D. Sloley and A.V. Juorio, Monoamine Neurotransmitters in Invertebrates and Vertebrates: An Examination of the Diverse Enzymatic Pathways Utilized to Synthesize and Inactivate Biogenic Amines. G.P. Reynolds, Neurotransmitter Systems in Schizophrenia. T. Müller and H. Kettenmann, Physiology of Bergmann Glial Cells. Chapter References. Index. Contents of Recent Volumes. Published since 1959, this serial stays up-to-date with current topics in neuroscience; the contributors are first-class experts in their fields. 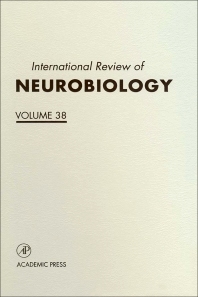 Volume 38 of International Review of Neurobiology presents in-depth reviews on GABAA and other transmitter systems and mechanisms, the genetics of the basal ganglia, the Bergmann glial cell, and the modes of action of monoamines at the cellular level. Neuroscientists will find particularly useful the recent studies on the molecular biology of neurotransmitter transporters. Researchers, clinicians, and graduate students in neuroscience, genetics, pharmacology, biology, and physiology.